Home » Moisture Meters » Wood Division Knowledge Base » Can Wood Floor Cupping Be Fixed? You’ve had a beautiful hardwood floor installed in your home. But after a while, something doesn’t look right—or feel right. Maybe the floor seems “wavy” or even rippled. You may notice small, raised ridges along the edges of some of the planks in the floor. What’s happening to your previously gorgeous flooring? And can it be stopped? Cupping is one of the unfortunately common issues that can plague hardwood floors. It can happen to most types of wood, and it’s often the first observable sign your floor is being affected by moisture. Since wood reacts to moisture so easily, floorboards can warp as they react to the change in their internal moisture content (MC) after the floor’s installation. But if you catch it early and can address the moisture issue, there is hope in getting your floor back to normal. What does cupping look like on a hardwood floor? When moisture interacts with a hardwood floor, the side of boards closest to the moisture expand. This expansion can be in the form of cupping (the center of the board is lower than the edges) or crowning (the center of the board is higher than the edges). 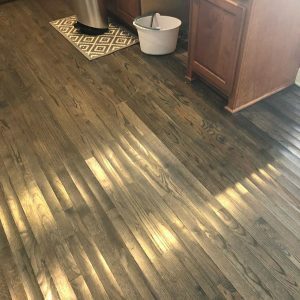 Both situations, although different, are both due to a moisture imbalance in the boards caused by either the addition of moisture or the extraction of moisture from the floor. Sometimes the early stages of cupping can be noticed when light comes in from a window and reflects onto a wood floor. You can see small shadows where the edges of each floorboard are slightly higher than the middle. In short, moisture. Wood, even when it’s treated and sealed, is still a porous, fibrous material. It can still react with the moisture content (MC) in the air around it. Materials like wood will balance (equilibrate) its MC with its surroundings, similar to the principle of osmosis. So if the air is humid, the wood will absorb more moisture from the air and it will swell. If the air is dry, wood fibers will release some of its moisture back into the air and it can shrink back down. It’s most common for moisture to enter the floorboards from below, through the subfloor. This is why the bottom of the board swells and makes the edges curve upward into an almost wave-like pattern. Cupping can happen even to a flawlessly-installed wood floor, depending on the conditions of the building and the environment. However, several common situations that are known to cause cupping can be addressed, and can even be reversed. What are common causes of cupping in a floor? Change in the amount of moisture in the air (relative humidity). If you live in an area with humid summers and dry winters, or even vice versa, your wood floor can react to the changing amount of humidity in the air. It expands during one season and contracts in the other. If cupping is happening in a relatively uniform manner throughout your house, and the degree of cupping is not drastic, this is likely the cause. Subfloor moisture. If there is excess moisture in the concrete slab, crawl space, or basement below your wood floor, this can cause cupping. This is especially common with new construction if the floor is installed before any type of HVAC is running within your home. It can also happen later if your basement or crawl space harbors more humidity in general. Leaks or spills. Cupping due to leakage will usually be confined to areas around sinks, dishwashers, etc. If a leak is slow or small, the cupping can occur gradually and you may not notice it until it has gotten worse. Sudden leaks or spills can cause cupping if they aren’t cleaned up quickly or thoroughly, or some moisture is left behind. Improper care/cleaning. On a similar note, especially when cleaning up larger leaks and spills, cupping can come about if any moisture is left behind after cleanup. What’s more, unless proper cleaning techniques and supplies are used, further damage could result as well. Improper installation. 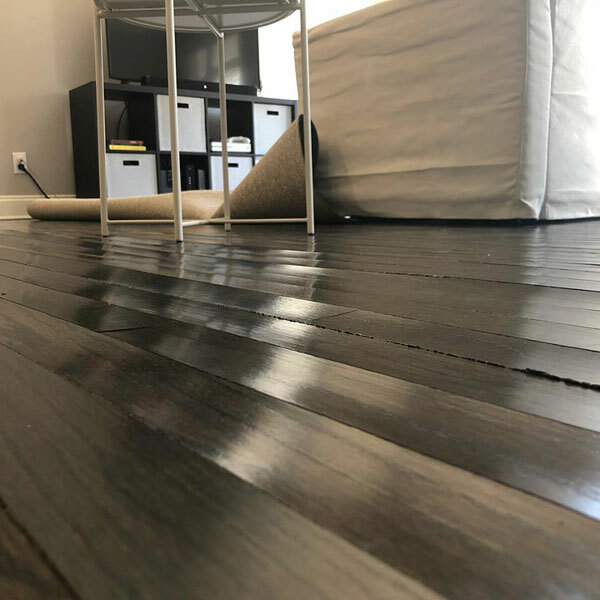 If a hardwood floor is installed before a subfloor is properly dried, or before the floorboards reach an equilibrium moisture content (EMC), such as before the inside of a building’s air is conditioned, there is a chance for cupping later on. As furniture and people begin to inhabit the area, it will bring about a new level of moisture and temperature to the air. You want to ensure that moisture levels between the subfloor and the finished floor have reached proper EMC for the long-term. And to make absolutely sure the moisture readings are optimal for beginning the installation, you want the most accurate moisture measurement tools possible. If cupping is discovered in an already-installed hardwood floor, can it be fixed? Does it need to be replaced? In many cases, if cupping isn’t severe, the issue can be fixed once the moisture issue is fixed. Since the process of cupping is the wood reacting to moisture, if the wood’s moisture level returns to the proper equilibrium, the cupping can resolve. Depending on the type of moisture issue, however, will determine how easily it can be fixed or how much effort it will take. Make sure you have a reliable wood moisture meter so you know how much the wood moisture content has risen or can identify wet problem areas. While several types of meters are available, few allow for multiple tests in multiple areas over and over without damaging the wood. 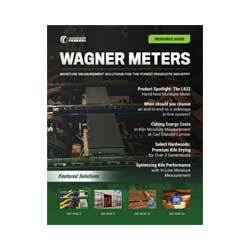 The Wagner Meters Orion® moisture meter line uses electromagnetic wave frequency (EMF) to measure large areas. Determine where the moisture is coming from. As referenced above, is the cupping uniform and seasonal? Is it confined to one area? Has the floor been installed recently, or could there be more moisture in your crawlspace or basement than in the living space? Get a dehumidifier, especially if you have a basement or an area of the house that tends to be more humid than other areas. If you live in a place with humid summers, you may just need to run it seasonally to keep your wood floors in top shape year round. The key is controlling the climate in your home, keeping it as consistent as possible. Maintain your floor properly, using the right cleaning methods and products made specifically for wood floors. Always dry spills thoroughly, and routinely check wood floor areas around sinks, dishwashers, bathtubs, and other areas more likely have leaks or spills. After a significant leak or spill, especially if water or other liquids have had time to absorb into the floor and subfloor, you may need to contact the professionals for high-powered drying equipment. A dehumidifier is great for humidity in the air, but wet wood floors need a more direct and aggressive approach to avoid lasting damage. What happens if cupping doesn’t get fixed? Besides the visible warping of your hardwood floorboards, the floor could fail. The cupping could continue to worsen and create gaps between the boards. If/when the relative humidity drops, the boards may not go back to their original shape and can buckle away from the subfloor, or even splinter and crack. The big issue, however, is still moisture. If the cupping in the floorboards doesn’t go away, it could mean that the underlying moisture issue was not properly addressed and still needs some attention. While cupping can remain after a severe event like flooding, persistent cupping is worth investigating. Prolonged moisture issues can lead to many types of flooring failures, so it pays to be safe. What NOT to do when you notice cupping in your floor. One rookie mistake is to simply sand the floor down until it’s level again. But once again, the moisture problem that caused the cupping has not been dealt with. For example, if the cupping happened due to humidity from an especially wet summer and you sanded down the cupped areas, when the air dries out the wood can warp the other way, causing crowning. You also don’t want to assume your floor has already failed. There is still hope! Many moisture issues can be fixed through household climate control, taking moisture readings throughout the house, or seeking out undetected leaks or spots where moisture could creep in from other areas. To avoid these mistakes, there is a way to test for a change in your home’s ambient conditions over time. Relative humidity data loggers can tell you what has changed in ambient moisture levels when it changed and for how long. This information can help you determine what actions to take with your flooring. The FIRST thing to do when cupping is discovered. If nothing else, the appearance of cupping tips you off that your hardwood floor is susceptible to moisture problems. Even before you call a professional, if you have a reliable wood moisture meter you can use to take multiple readings throughout your home, you’ll have a much better idea what kind of situation you have on your hands. You might be able to figure out how to remedy the situation yourself if you find it’s due to humidity in the air or a leak or spill. 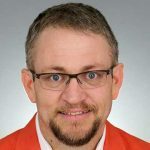 And if you do discover it’s a serious issue, you’ll have much more precise information to give the professionals so they don’t have to spend as much time (and your money) doing detective work. Safeguard your beautiful hardwood floors with moisture measurement you can trust. Learn more about how Wagner Meters’ Orion® moisture meter line is easy to use while providing the most accurate readings available on the market.